A VPDN is a network that extends remote access dialup clients to a private network. VPDN tunnels use either Layer 2 forwarding (L2F) or Layer 2 Tunnel Protocol (L2TP). Cisco introduced L2F in RFC 2341. It is also used to forward PPP sessions for Multichassis Multilink PPP. 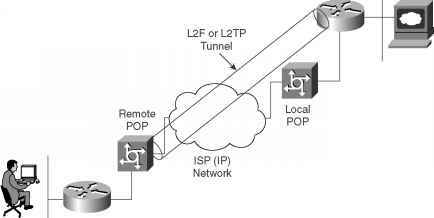 L2TP, introduced in RFC 2661, combines the best of the Cisco L2F protocol and Microsoft Point-to-Point Tunneling Protocol (PPTP). Moreover, L2F supports only dial-in VPDN, while L2TP supports both dial-in and dial-out VPDN. Both protocols use UDP port 1701 to build a tunnel through an IP network to forward link-layer frames. Step 1 Establish a tunnel between the L2TP access concentrator (LAC) and the L2TP network server (LNS). The LAC acts as one side of the L2TP tunnel endpoint and has a peer to the LNS. This phase takes place only when no active tunnel exists between both devices. (typically an ISP router) and the home gateway router. The remote POP accepts frames encapsulated in L2F or L2TP and forwarded over the tunnel. The LAC and LNS are hardware devices, such as Cisco's AS 5300 series router platform. The LAC's function is to sit between the LNS and the remote system and forward packets to and from each device. The LNS logically terminates the PPP connection. VPDNs are implemented so that users connected through ISPs in any part of the world can take advantage of the connection to the ISP and tunnel the company's remote access traffic through the ISP network. • Access to the corporate network from a remote location. • Offload remote access services to the ISP, which already has the infrastructure place. • End system transparency because the remote user does not require any hardware or software to use VPDN. Cisco IOS routers performs all the requirements. • Allows for accounting, which is sent from the home gateway router. Figure 5-6 displays a typical VPDN scenario where a PC or router dials the NAS/LAC to request a VPDN connection to the private network. • A Cisco router or access server for client access (NAS/LAC) and a Cisco router for network access (HGW/LNS) with IP connectivity between them. 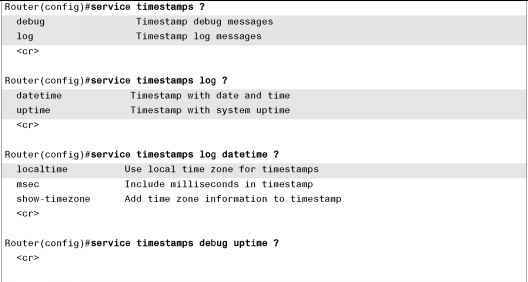 • Host names of the routers or local names to use on the VPDN groups. • A tunneling protocol, either the L2TP or L2F Protocol. L2TP is an industry standard, and L2F is a Cisco-proprietary protocol. • A password for the routers to authenticate the tunnel. • A tunneling criteria, either domain name or Dialed Number Identification Service (DNIS). • Username and password for the user (client dialing in). • IP addresses and keys for your TACACS+ servers. Step 2 The ISP's NAS accepts the connection. Step 3 The ISP NAS authenticates the end user with CHAP or PAP. The username determines whether the user is a VPDN client. If the user is not a VPDN client, the client accesses the Internet or other contacted service. Step 5 If no L2F tunnel exists between the NAS and the remote users' home gateway, a tunnel is created. Then, an unused slot within the tunnel is allocated. Step 7 The home gateway sets up a virtual interface. Link-level frames can now pass through this virtual interface through the L2F tunnel.